I can't believe my predecessor, Abe, actually agreed to allow this. In just about two months a flock of Civil War re-enactors will be arriving here at Marshfield Manor to camp out on grounds. Don't worry, they'll be far away enough from the mansion to stay out of sight of our visitors, and they'll be almost as far away from the hotel on property. Good thing, because we try to maintain an aura of elegance and beauty here at Marshfield, and from what I understand about re-enacting, the experience is not exactly cush. Poor Abe. He was such a Civil War aficionado and he was looking forward to this event. To be perfectly frank, I'm not. I wish Abe were still here to deal with these folks. They're extremely... shall we say... zealous? about their hobby. Scary to think about all those people without running water for an entire week. Without electricity. With... guns. Still, it's my job to make them feel welcome, my job to make sure everything goes smoothly for the week they're here. I've prepared as best I can. I've even granted them exclusive use of the grounds (no visitors) for the first several days they're setting up. Even though I've done everything right, I still feel as though something is going to go wrong. Have you ever had that nagging feeling? Like you've forgotten something important? And did it turn out that your gut was right? 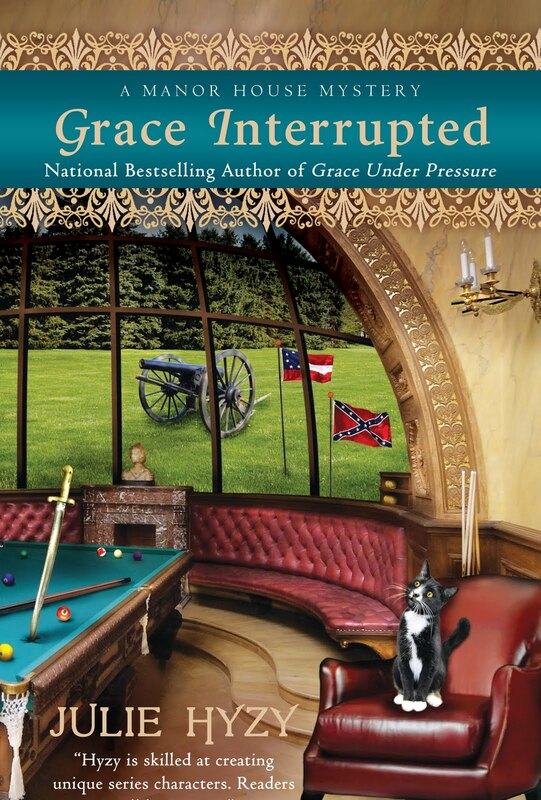 GRACE INTERRUPTED comes out June 7th. 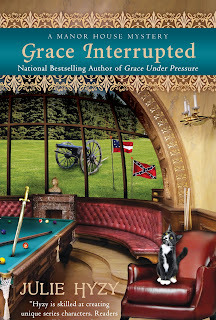 Learn more about Grace and the gang at Marshfield Manor with the first book in the series, Grace Under Pressure. Visit Julie Hyzy's website here. And - if anyone would like 5 or more Grace Interrupted bookmarks to share with friends, please email Julie, with BOOKMARKS in the subject header JulieHyzy (at) gmail (dot) com. And let me know where you'd like them sent. LOL! I live with that nagging feeling! I'm sure all will go well, Grace. After all, what could possibly happen? Civil war re-enactment? What could go wrong? Oh. Right. Thanks, Krista. I hope you're right! Mary Jane - I can only imagine what could happen. I sure hope my fears are unfounded! Yeah, but think of all those men in uniform! I have a very overactive imagination so I always have that nagging feeling. Whenever I'm stressed I have a nagging feeling that I'm forgetting something important. Usually it's just the stress. But you know what they say, even paranoid people sometimes have reason to worry. Keep your eyes open, Grace. Those Civil War re-enactors are a serious bunch. Oh! I can't wait for this one! I have that feeling all too frequently. I'm sure it will all go *just fine*! That's exactly what I always say, even when something is just about to go horribly wrong... good luck! Thanks, you're all helping to put my mind at ease. Maybe I'm still just on edge a little bit. Heather, I hear you about the men in uniform, but I'm still hoping to connect with Jack. I wonder if he's hoping to connect with me... I guess I'll find out soon enough. A whole week? Grace, this should be very interesting. And entertaining for us. I can hardly wait to read more about your adventures! Now, it seems like I needed to tell you something - what was it? Oh, dear.